The owner and/or operator of any retail store, building, housing complex, gas station, or other place of business, has a legal duty to ensure that the property is free of hazards that could cause visitors harm. Unfortunately, far too often owners/operators do not take adequate precautions, and put the bottom line above basic customer safety. 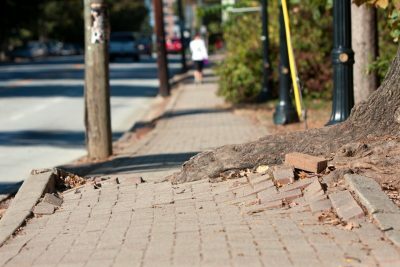 If you or a loved one has been injured, disabled or killed as a result of slipping or tripping on the property of another, these losses may be due to the property owner and/or operator’s negligence. If the owner or operator was negligent in maintaining their property, they are liable to the injured party for the injuries, including medical bills, and any emotional distress caused. The owner and/or the operator of property has a duty to maintain it in a safe way when guests are invited on to the property. This applies to store owners, as they are inviting customers to come in and purchase their products, as well as owners of equipment and buildings. This also applies to owners of sidewalks (usually, the government), as these are held out for public use. However, property owners are not automatically liable for any injuries sustained on their property. In order for the owner to be liable, they must have been negligent in maintaining the property, and the negligence must have caused the injuries. ANAND LAW fights for your rights, leaving no stone uncovered. We will ensure that you and your family receive the fair treatment and compensation that you are entitled to. We provide compassionate yet aggressive representation to ensure that all avenues of justice are pursued. Whether the owner of the property is insured, self-insured, or neither, they will not have your best interest at hand. ANAND LAW will vigorously seek to provide your family with just compensation for medical bills, pain & suffering, and lost wages. If we do receive an adequate settlement offer, we will sue the responsible parties, and, if necessary, take it all the way to trial. Tripped and Fell on a Sidewalk in Los Angeles? Here’s what you need to know.